Welcome all Healthcare Providers including Homecare Agencies, Long-term Care Facilities and private families in search of professional caregivers. We understand that finding and employing qualified caregivers can be challenging but is crucial to the success of your business. Families' similarly struggle to hire and retain competent caregivers to care for their elderly loved ones at home. Fortunately, however the internet has opened up an excellent avenue for promoting caregiver positions to a vast market of potential prospects. 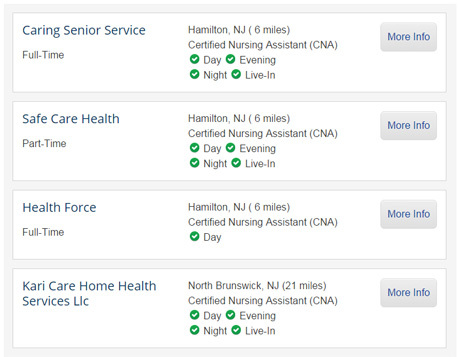 Posting job openings online enables a healthcare provider or family to reach prospective caregivers that they otherwise would not have located. Advertising job openings via the internet often generates a timely response and produces an ample applicant pool. As a provider your job posting should accentuate not only salary enticements, but other incentives such as caregiver recognition programs, merit increases for job performance, skills training classes and continuing education in-services. When families hire caregivers privately they will find that caregivers are attracted to flexible schedules, guaranteed work hours, and a pleasant home environment. Take advantage of the internet to highlight valuable benefits of a job opening in order to draw in a sizable pool of promising candidates and at the same time appeal to qualified caregivers.